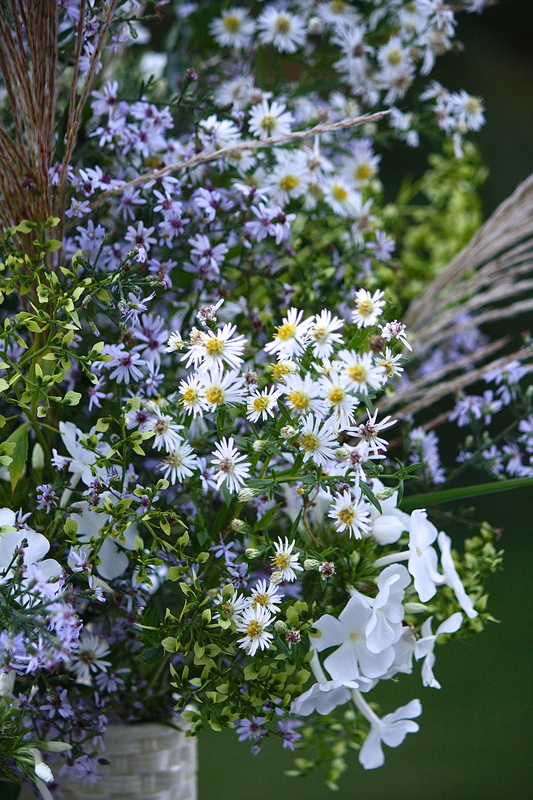 This week I’ve used two wild asters for the bulk of my arrangement: blue wood aster (Symphyotrichum cordifolium), (which looks purple to me, you can see a big mound of it in my garden in the background) and white lance-leaved aster (Symphyotrichum lanceolatum). The asters this year have been stupendous and they are blooming everywhere! Nature’s last hurrah before frost shuts down garden operations here in New England. I still have a fair amount of white phlox (P. paniculata) and white spider flower (Cleome hassleriana) left in the garden, though they are coming to the end of their flowering. The cleome are already dispersing seeds, ensuring more flowers for next year. 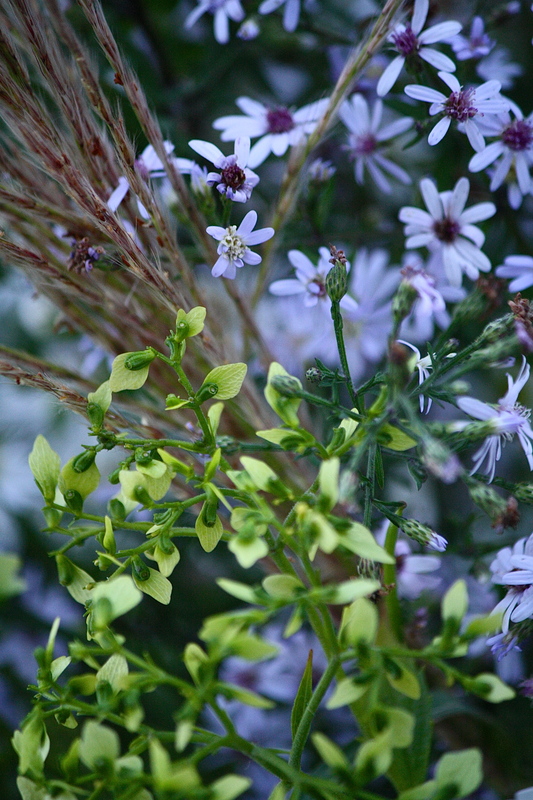 Chartreuse, winged seeds of patrinia (P. gibbosa) and flowering panicles of maiden grass (Miscanthus sinensis), looking a bit like fireworks, complete the arrangement. My container is a treasured basket-weave vase that I bought so many years ago I don’t recall whether it was at a yard sale or antique shop. It is unique in that it has three openings set in a triangle. A few years later, I came across another similarly designed, square, covered container with a bamboo handle, which I bought to complete the set. Both are stamped “Made in Japan.” I saw a similar container on Etsy, claiming it to be from the 1950s. Regardless of the details as to their vintage, I adore them! 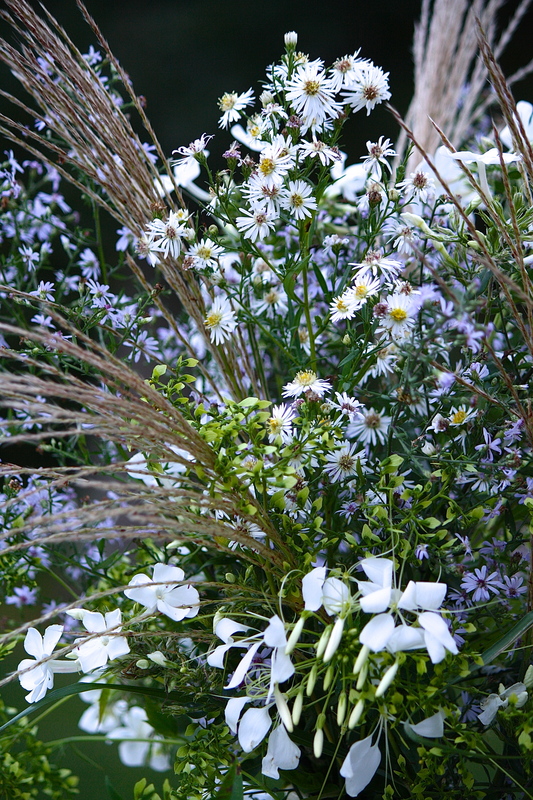 This entry was posted in Country Gardening, My Photos and tagged blue wood aster, Cleome hassleriana, flower arrangement, garden phlox, gardens, In a Vase on Monday, maiden grass flowers, meme, native asters, patrinia seed heads, photography, Symphyotrichum, Weekly Vase Challenge. Bookmark the permalink. Great combination, thanks for sharing, Eliza! It does look a bit flamboyant, doesn’t it? 😀 Many thanks! Lovely, lovely as always. I so look forward to these posts. Awesome arrangement Eliza – love seeing your florals! Many thanks, Mary, so glad you liked it! A beautiful stunning vase….asters are blooming everywhere here too…I love the muted blue as it works beautifully with the whites…great container/vase too! i always like the balance of science (scientific names, etc.) with your artistic side. You show a great balance between understanding the role of the plants along with their beauty. Yours is a magnificent display Eliza. The flowers look so very fresh and the vase is most interesting. The Miscanthus adds a bit of extra excitement to the mix, Eliza. Very pretty! Beautiful flowers as always Eliza. I love your wild Asters. I agree with Kris. It’s a very pretty arrangement. Well I think the addition of the miscanthus was a great idea. The vase looks to be a useful vessel and very attractive to boot. 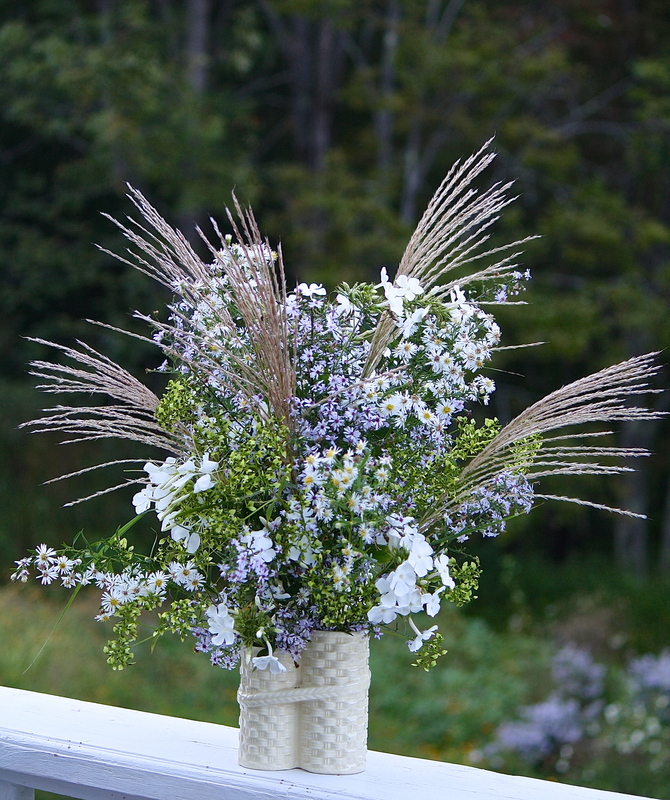 Oh, how I love those Miscanthus blooms! What a great addition to this arrangement Eliza. I am enjoying the cooler weather immensely. So many nice little details Eliza! I wish I could call you every time I want to send flowers! 😀 What a lovely compliment. Thank you! I envy you that lovely white phlox Eliza! 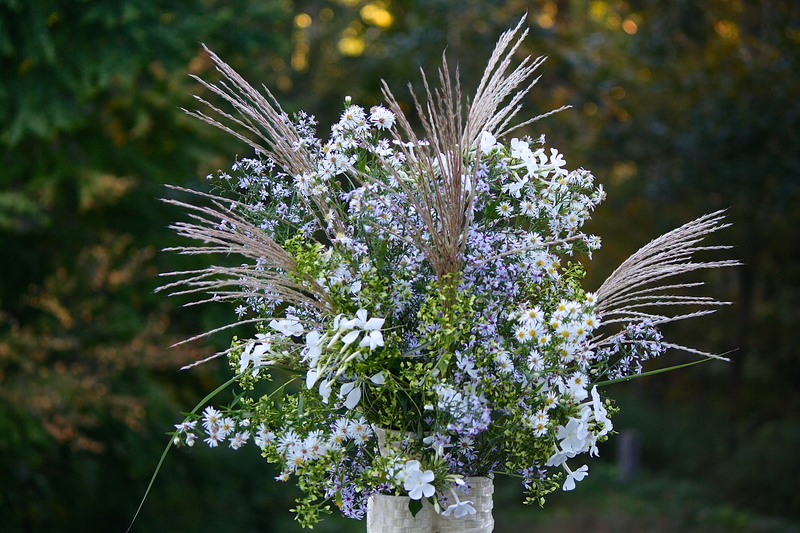 White goes so well with grasses. The little blue asters are pretty too. Mine didn’t like the dry summer but may produce a few blooms yet! The deer nibble it sometimes and powdery mildew can be problematic, but it is a good perennial performer that really holds my garden in late summer. 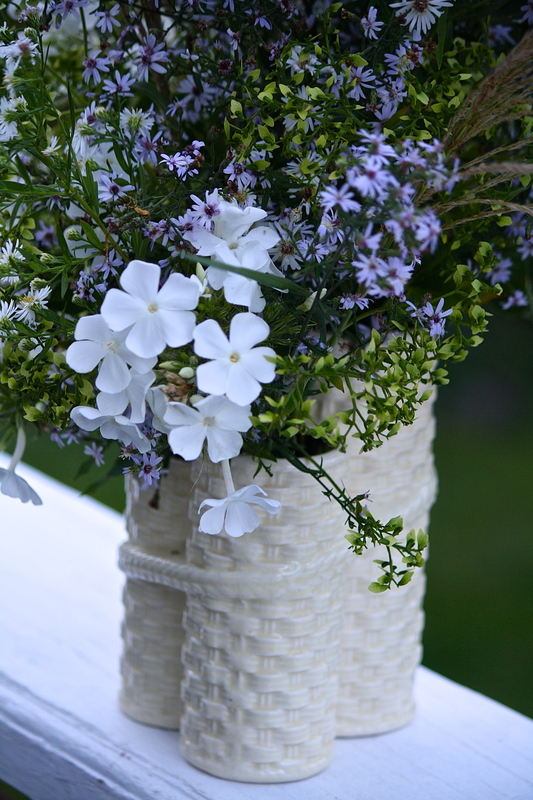 The cloverleaf shaped basketweave vase is a real treasure for displaying flowers easily, and you have a fantastic amount of flowers to put in it, I like all the different flower shapes and colors, and the accent of the grasses. I thought I would have a couple of aster plants covered with flowers but a deer got in and ate and broke them off, so I especially like to see yours, which are probably similar. Thank you, Kim. The process is soothing & to create something beautiful to look at is always rewarding. Thanks for stopping by! Thank you so much, Micheal. Yes, it is quite a thick, glossy glaze. I love the ivory color, basket weave with rope detail. Simple yet elegant. Hope all is well with you. The heat must be abating by now? I don’t often see vases with glaze that thick. Interesting and appealing. All is well here, thanks Eliza. I keep thinking autumn will get here, but I think it missed the off-ramp. Temps between 90-100 last week and this week.We have a prediction of a high of 80 this coming Sunday (plus perhaps some rain!!!) which would be so welcome. We had several weeks of 90’s and 100’s, during which time our air conditioner broke. Yikes, but its fixed now. Sounds like hell! Wishing you cooler temps!